‘Fabulous shoes, my badly made stews, an Antarctic cruise and ten pounds to lose. Having to schmooze when I’d far rather snooze. Skin care and bad hair and what should I wear? 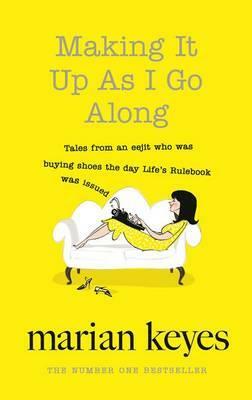 Welcome to the magnificent Making It Up as I Go Along – aka the World According to Marian Keyes™ – a bold, brilliant book bursting with Marian’s hilarious and heartfelt observations on modern life, love and much, much else besides. Such as? you are determined to ask. Well, how about her guide to breaking up with your hairdresser? Or the warning she has for us all after a particularly traumatic fling with fake tan? There’s the pure and bounteous joy of the nail varnish museum, not to mention the very best lies to tell if you find yourself on an Antarctic cruise. She has words of advice for those fast approaching fifty. And she’s here to tell you the secret, secret truth about writers – well, this one anyway. You’ll be wincing in recognition and scratching your head in incredulity, but like Marian herself you won’t be able to stop laughing at the sheer delightful absurdity that is modern life – because each and every one of us is clearly making it up as we go along. Marian Keyes is the international bestselling author of Watermelon, Lucy Sullivan is Getting Married, Rachel's Holiday, Last Chance Saloon, Sushi for Beginners, Angels, The Other Side of the Story, Anybody Out There, This Charming Man, The Brightest Star in the Sky, The Mystery of Mercy Close and The Woman Who Stole My Life. She has also published two collections of journalism, Under the Duvet and Further Under the Duvet and Saved by Cake, an extremely honest account of her battle with depression and how baking helped her. Marian lives in Dublin with her husband.